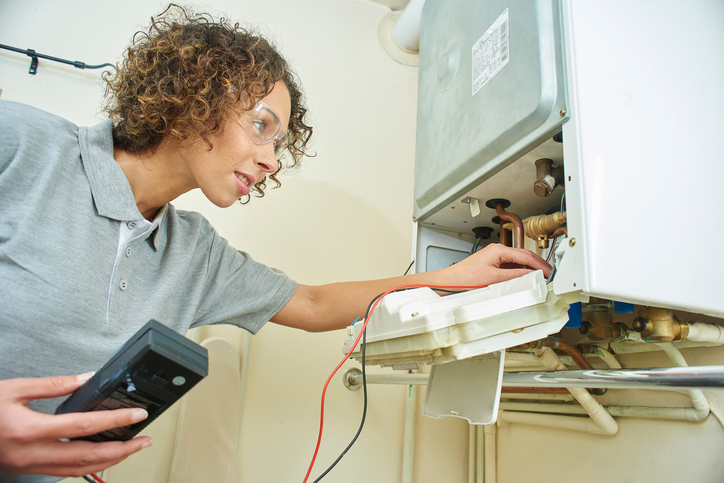 If you have an aging, oil-fired heating system and are dreading the day you’ll need to replace or service your heating system, you may want to explore converting from oil to gas; heating your home with a cleaner, more fuel-efficient system will shrink your energy bill in the process. The numbers don’t lie. Heating your home with natural gas is cheaper than heating with oil. But comparing the current market price for the various fuel sources won’t tell the whole story; after all, oil and propane are measured in gallons and gas is measured in therms. To accurately examine the cost of fuels based on the heat content they generate, the U.S. Energy Information Administration recommends using this formula—cost per million British thermal units (BTU). In states like New Hampshire and Massachusetts, natural gas is the clear winner, according to this comparison provided by the N.H. Office of Energy and Planning, which details the average price per million BTU for gas, oil, propane and other fuel sources. Average residential energy bills are much lower for households heating with natural gas, according to this 2016-2017 winter heating bill data from the Massachusetts Office of Energy and Environmental Affairs. Homeowners who heat with gas are also less vulnerable to price swings. This is at least partly because a greater percentage of natural gas used in the U.S. is produced domestically, while we remain much more dependent on petroleum-producing nations for our oil supply. Switching from oil to gas can also produce savings because gas furnace systems generally cost less than their oil-burning counterparts. Because oil burns hotter, the furnace must be built from more robust materials to withstand the heat. Taking steps to reduce your impact on the environment is an increasingly important consideration for many people. There are also financial savings to be realized by converting to a cleaner-burning system. For example, because heating with oil produces more carbon buildup than gas, having the system regularly cleaned is essential for safety as well as efficiency reasons. Studies have shown that a buildup of 1/16 of an inch of soot can decrease overall system efficiency by 7-8 percent. The need to regularly replace oil filters also adds to annual maintenance costs, which can be as much as two to three times higher than for gas heating systems. Does Your Home Have Access to Natural Gas? To reap the potential benefits of switching from oil to natural gas heat, you’ll obviously need to have access to the supply. Is there a nearby gas main? If not, are there plans to expand into your area? If you do have access, you’ll need to contact your natural gas distributor to discuss running a line from the nearest gas main to your home and installing a meter to measure your usage for billing purposes. If not, contacting your area’s natural gas provider will enable you to determine if there are plans to expand access to your location. The expenses involved in getting your home connected can vary. The utility may perform this function at little or no cost for homes that are relatively close to the nearest pipeline (after all, they want your business). However, if you live at the end of a long driveway or in an area that might present excavation challenges, the charge to get you hooked up can be fairly significant. If you do decide to convert from oil to gas, remember that the utility isn’t going to dig into frozen ground to run a line to your house in the middle of winter; plus, they may be booked up in the fall, so spring and summer can be a better time to schedule that work. For homes that do not currently enjoy access to natural gas, propane can be another option that burns cleaner than oil. However, because it is a more expensive fuel source (cost per million BTU) than both gas and oil, saving money on your energy bill is not generally a motivation for making the switch to propane. One additional quality-of-life consideration is that heating with oil requires you to have one or more unwieldy oil tanks, usually located in your basement. These tanks deteriorate over time, potentially causing a safety hazard. Plus, they produce odor and grime. Many homeowners find that getting rid of those bulky fuel tanks creates an opportunity to make better use of your basement space for tool shops, laundry areas or family playrooms. When you’re considering making the switch from heating with oil to heating with gas, start by getting some expert advice from a trusted home heating contractor who can conduct a thorough analysis of your home’s existing system and thermal design, and then have an in-depth conversation about your objectives and options. Heritage PHCE is a NH- and MA-based home heating contractor with 30 years of experience installing, repairing and maintaining both oil and gas heating systems.